On the 15th of February 2019, the fourth edition of Poland-Japan Clean Coal Technologies Seminar took place in Warsaw. Marek Skrzypkiewicz (PhD) and Jakub Kupecki (PhD) took part in this event representing IEn's Department of High Temperature Electrochemical Processes (CPE). On the 28-29th of January 2019 the meeting of BALANCE project took place at the Federal University of Lausanne (EPFL - École polytechnique fédérale de Lausanne), Branch in Sion, Switzerland. Two researchers took part in the event - Yevgeniy Naumovich (PhD) and Konrad Motyliński from the Department of High Temperature Electrochemical Processes of the Institute of Power Engineering. 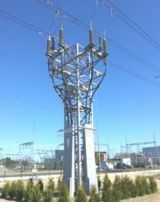 In the October 2018 issue of the magizine Przegląd Elektrotechniczny there have been published 2 articles prepared by researchers from the Institute of Power Engineering - prof. Jacek Wańkowicz, Piotr Papliński and Hubert Śmietanka. During the official gala held on the 15th of November 2018 in Brussels, as part of the annual meeting of Fuel Cell and Hydrogen Joint Undertaking (FCH-JU), prizes were awarded to three young scientists conducting research related to the development and implementation of hydrogen technologies. The pan-European competition highlighted researchers involved in the use of fuel cells andelectrolysers in power engineering (Energy Pillar), transport (Transport Pillar) and interdisciplinary research and legislative work (Cross-cutting Pillar). Jakub Kupecki (PhD), head of the Department of Hightemperature Electrochemical Processes (HiTEP) of the Institute of Power Engineering received an award in the area of energy. The partners of VULKANO project met in Rome the second week of December 2018 in Rome (RINA facilities) to share the activities carried out during the three years of life of VULKANO, as well as to plan the next year 2019 which will be the last execution. From this meeting, it is remarkable the great collaboration between the partners, the demonstration leaders and the solution developers, in order to address the technical challenges that the consortium must face in the coming months. 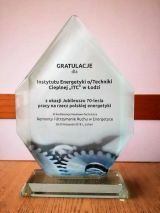 During the gala of the XIth conference held in Licheń "Renovations and Maintenance in Power Engineering", the director of IEn's Thermal Technology Branch „ITC” in Łódź, Jacek Karczewski (PhD) was awarded for the scientific activity of the Branch for the benefit of the Polish energy sector.